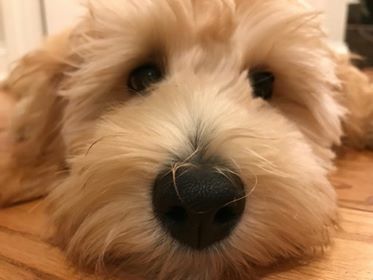 We've listed Crockett Doodles reviews of our Goldendoodles and Labradoodles as well as reviews of other doodles from our partner families (Aussiedoodles, Springerdoodles, Newfiedoodles, Sheepadoodles, Irishdoodles, Bernedoodles, Saint Berdoodles, Pyredoodles, Cockapoos and Cavapoos). We strive for 100% customer satisfaction and have very, very few complaints during the years. The very rare complaints through the years, we've tried to address fairly. We feel privileged to have received so many incredibly positive testimonials through the years. Every day we get a couple emails from very appreciative families. It helps us love what we do. Below is a sampling of what people are saying about Crockett Doodles. 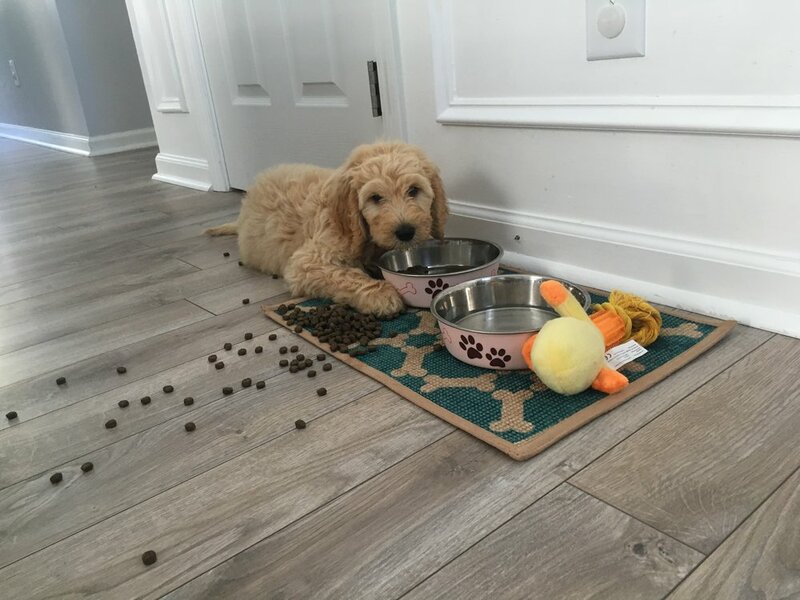 We would also encourage you to follow our Crockett Doodles Facebook page to see daily testimonials of families who are thrilled with their doodle puppy from us. Our red Labradoodle George Washington is doing great! Here he is today pictured with our youngest son Callen. Thank you for working with us. He’s everything we hoped for. 2 WEEKS LATER: Nathan - here are two more George pictures. I won’t overload you but I love these two. Thanks! Have a great week. Good evening Nathan, I wanted to send a quick note about “Annie” aka Wynnie. She is a wonderful puppy... Your family has done a great job with her. She is smart, sweet, loves other dogs and people. She is well behaved and doing very well with house training. Thanks for everything. This was a great experience. If there is anywhere I can write a review I would love to share how great of an experience it has been working with you. Here is a recent picture of our traditional mini Goldendoodle Lola from Crockett Doodles. She is adorable! 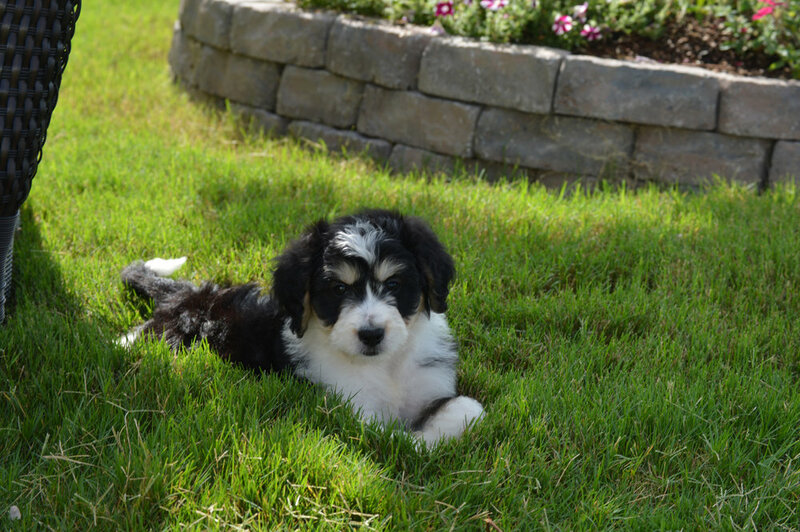 We are thankful for you and your genuine, dependable dealings with puppy families. We have been very happy with the entire experience and your prompt responsiveness and attention to detail. Thanks again for letting us have her in time for Rhea’s birthday surprise. I hope we can have many more of your puppies for friends and families around us in NC. 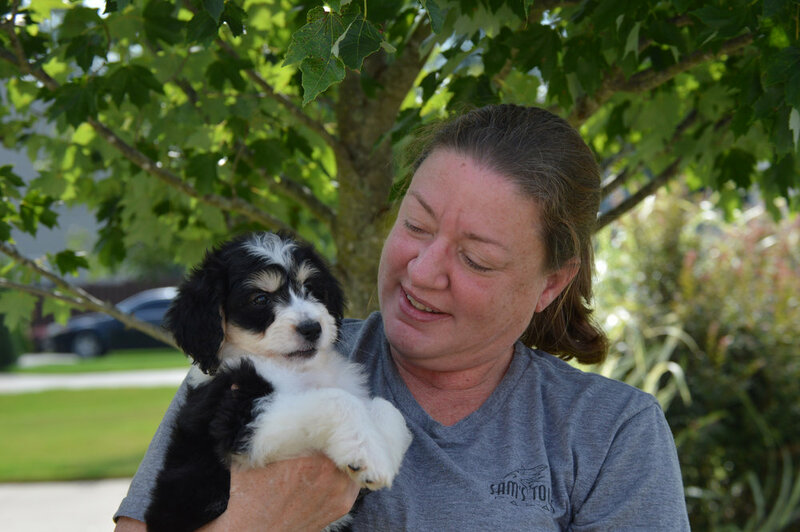 Dixie (formerly Brynna), our Springerdoodle from Crockett Doodles, is doing so well. Very smart. Sits, gives a paw, lays down, barks when she hungry, wants water and when she has to out. I know how many emails you get but I wanted to take a second to thank ya’ll for our sweet puppy. We have absolutely adored having him in our family. He has so much personality and is absolutely adorable!! Training has been a learning curve for us but he is so smart and definitely made things easier than we expected. I wanted to send ya’ll a picture. 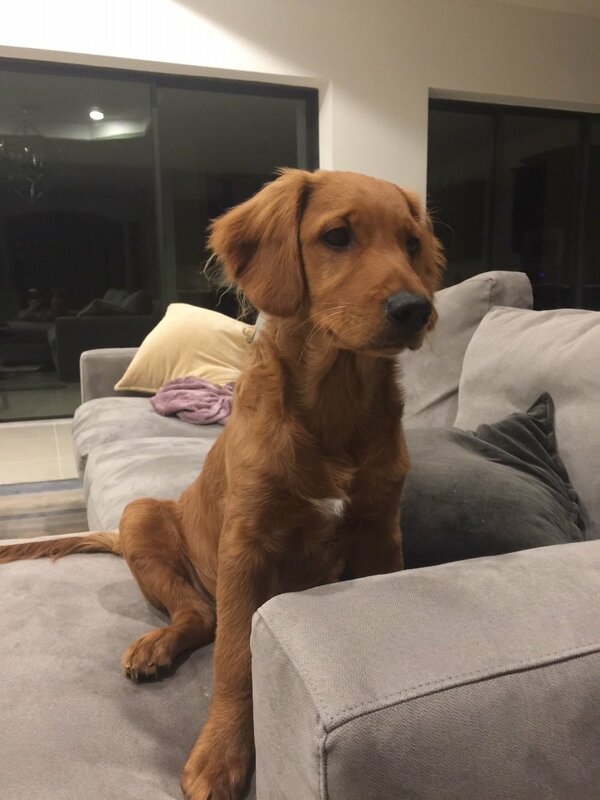 He just turned 5 months and is getting so big! Wanted to drop you a quick note - our Goldendoodle Astro (our name for Gilbert - to go with our present dog Cosmos) is doing well. Our vet did Astro’s evaluation and everything looks good (no worms or the like), so we are good there. He is doing really well on your recommended TLC food and we are going to leave him on it (we are going to try and swing Cosmos over to the adult food when Astro changes to it). We wanted to thank you for the great information in the binder (even though this is our second puppy, we picked up quite a few useful tips reading through it), the nice pictures, the book of Psalms, leash, collar, Nylabones, whole bag of food, and the other bits. Astro and Cosmos are progressing along the expected line of older dog introduced to a new puppy. Today they’ve settled things out enough to play quite a bit with each other. Finally, attached is a picture of Astro chilling out in his new home. Thanks again for doing a fantastic job with this puppy! We are so happy to have him as part of our family. 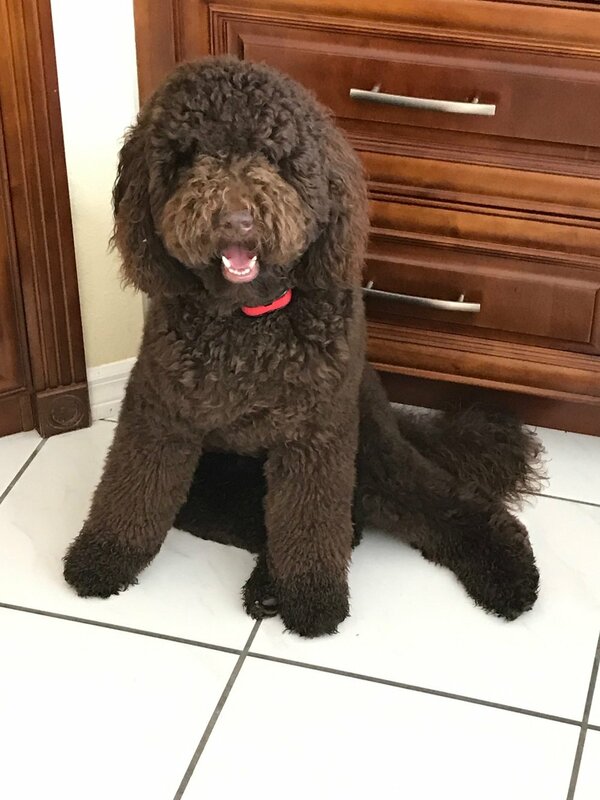 Nathan and Amy, I wanted to send you a note to pass along an update on our Labradoodle, Charlie. She has been a total pleasure since she joined us less than 2 weeks ago. She is a wonderful, healthy and playful puppy. She has had minimal accidents and continues to sleep through the night with not one accident in her crate. Today she walked over to the door and sat down to let us know that she needed to go out and then did both businesses in a very timely manner. Our daughter, Millie, is loving on Charlie and has really stepped up with many of the daily care items. Charlie loves “hunting” big leaves in the back yard and has started to pick up on the retrieving of her LambChop. Finally, she does enjoy her naps as she goes full throttle and then crashes. A great little girl that is smart and playful. On a process note, I wanted to let you know that everything went extremely well and I would definitely recommend people contacting you if they are interested in labradoodles or goldendoodles. Let us know if you need anything from us. We are so happy that she has joined our family and hope you both have a wonderful Christmas. Thanks! Dr. Crockett, Rita is 5 months old today and weighed 23 pounds today. See how nice she posed for her 5 month old photos with her tongue hanging out after our 35 minute walk this morning. My husband takes her out and she goes potty, and then will come right back in and go right back to sleep till about 6:30am. She doesn’t whine at all. She has been a DREAM! Nathan, We are enjoying our Aussiedoodle puppy Charlie so much. The kids are over the moon. It was the best family surprise ever. We will never forget it! Matt and Amy were so gracious and wonderful. Thank you for the manual and all the info. Your description of the litter was very helpful and accurate as we are 40+ hours into being his new owners. He is so happy to play and also let us take the lead. Hi Nathan! We are the parents of Waffles (born and named Charlotte when we visited you), and we love her so much! She’s doing so great, and I doubt there is a dog more adored in the world. Thanks, Nathan, I hope you’re well, and who knows, maybe we’ll be getting another dog from you some day. [3 months later] Hi Nathan! We bought Waffles (Charlotte) from you about 18 months ago and we are thinking about getting another doodle for her to have a friend. Do you have any litters coming up this year? Hope you’re well! [4 months later] Thanks!!! And now of course we’re talking ourselves into another doodle puppy since that’s really the only dog we want. If you have puppies let us know that too :) We would likely only get one from you. Thanks again! Perfect, thanks again for everything Nathan. The entire process has been so informative and clear. We really are so grateful to be adding a little Labradoodle pup to our family! I can’t remember exactly how I was supposed to do this, but I have attached the paperwork from the Vet showing that The Judge has been neutered. He is not a fan of me right now haha! I also attached a picture of him in his cone because he is still the cutest dog in the whole world! Quick update regarding our beautiful new Cockapoo puppy Charlotte. She is doing great. She was a trooper on the trip back to Florida and managed to make it to our doorstep without an accident. I recently posted a few pictures to my facebook page where you can see pictures of my son loving on his new puppy. I thought I would share a picture of my amazing Paddington! I think he is going to be a big one! Wanted to give you an update before heading out to church. Lucy is wonderful and a joy to our family. She is now 10 lbs. at 4 months. Long and lean. We had 2 grandkids here for 5 weeks (3 years and 18 months) and she was a delight in playing with them, protecting her from them but most importantly sending them back home without a mark on them. She was gentle with both, even when one of them fell on her. She has many friends on this island and many have asked where we got her. We are able to take her many places with us and hear all the time about “we saw you with Lucy’. The golfers love her and she is now trained to sit quietly unless one says hi to her and Bob or I give her the ok to go say hi. We took your advice and socialized her early, but protected her from too much until she was a bit older and now has had all her shots for this year. So here are a few pictures of our beauty. You may hear from a few families from Edisto. I just picked up my baby girl Remi (petite mini Goldendoodle). I just wanted to let you know how amazing the whole experience was and how satisfied I am with my puppy. She is perfect and everything was done so professionally. Thank you so much and you’ll definitely be hearing from me again! Hi Nathan, sorry to bother you, but I was wondering if you if was ok to wait until next week for Maggie’s vet visit (our standard chocolate Labradoodle from you). Our vet likes to space the vaccinations 3 weeks apart. . . Thank you!!! She is adjusting well and we just love her! [3 weeks later] She is getting big, 12 pounds 4 oz now. [4 months later] Maggie has gotten a bit bigger (smiley face). I will send you a picture after her haircut (smiley). She was 37 lbs at last weigh in 2 weeks ago, and she’s been gaining 1-2 a week. 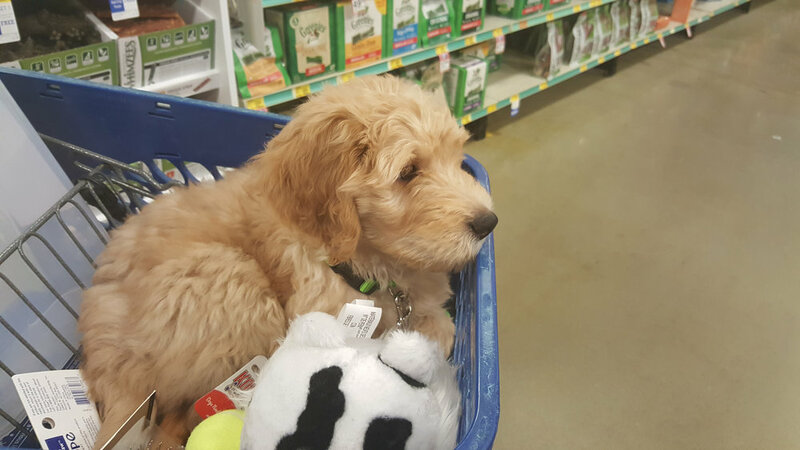 We have had 2 nights with Tilly, our mini Goldendoodle now, and both nights she has “slept through the night”. The first night was 6 1/2 hours and last night was 9 hours. Is this okay? I have read that puppies can’t hold their bladders for long, but as long as she is in her crate, she does fine. We take her out as soon as she whines in the morning. I will add that she doesn’t sleep at all during the day, even when she’s in her crate, so I’m thinking this is why she sleeps so much at night. We’ve only had two nights, so maybe she was just really worn out from playing with our four kids. She is doing really, really well. She had some accidents yesterday, but hasn’t had any today. She stays in her crate with no issues. She really doesn’t even get into much trouble when she’s out. We can tell that your family and her guardian family really trained her well. I feel like we’ve just been keeping it up, which is perfect for us, being first time dog owners. Nathan, I am so delighted that things worked out for the mini Springerdoodle Rhett, aka Bobby, to become part of my family. What a precious boy! As you can see his big sister Paisley, in her Thundershirt, has begun accepting him, and he has stolen my heart! Bella is doing well. We are crazy about her, and she is doing a good job of her training of us! She weighs 8 lbs. now. Today Bella was spayed at Foothills Vet. I have attached an invoice from them for this service. She is, of course, very lethargic this evening, and we feel for her. She normally sleeps on our bed which she has to jump up to, but she should not be doing any jumping (we are amazed how high she can jump and how fast she is as a runner!) so Priscilla will sleep with her tonight in another room where she can’t jump or climb. We had to borrow an air mattress so Priscilla can sleep on the floor. I just wanted to send a follow up email to thank you for our wonderful new puppy. Carter (Amos) is adjusting well. Our vet said he was perfect in every way. We just love him. Hi, Dr. Crockett. Back on June 9 we adopted from you a labradoodle puppy named Dugan, and Rebecca, who handled the adoption, told us that you like to receive pictures now and then of the puppies you have placed in homes. So I thought I’d send you a couple of pictures of our dog before and after his first professional grooming. He seems to hate the heat of the summer, so we got a “summer cut” for him. I believe he’s now 13 weeks old; we’ve named him Moultrie, after William Moultrie, the hero of Fort Moultrie in Charleston, SC, during the American Revolution (I’m a history buff). We love him! We really enjoyed meeting Matt and Amy!!! It was the best experience ever!! They were so friendly and helpful! We are madly in love with our toy Goldendoodle Sally (aka- Minnie). I just wanted to thank you for everything!! I’ve had about 10 people ask for your contact info already. We could not be any happier! She is the sweetest puppy ever!!! And a good sleeper, too! She slept through the night last night! I thought I would share our sweet photos of Sally that Amy took. I hope you’re doing well. It looks like you guys have been busy adding some new doodle mixes to your family. They are all adorable! We cannot thank you enough for matching us with her. Jacob is the cutest puppy on earth. My family was visiting this weekend and all fell in love with him. He and Grace have a ball playing. His personality is wonderful. Just wanted to send you two pictures of Stella, our mini Goldendoodle from Crockett Doodles! She is doing extremely well and got a clean bill of health from the vet this week. She also slept from 9:30 until 6:00 last night in her crate without getting up! We just couldn’t believe it! Sad to have missed you when we picked up our Aussiedoodle girl Sunday. We’ve changed her name from Callie to Apricot, and we just love her to pieces. Matt was wonderful giving us all the information and the photos. Thought you’d like to see an update photo of our sweet puppy, Rosie (formerly Lily)! She has adjusted well & is SO much fun...sadly, our 13 yr. old dog hasn’t gotten ‘on board’ with her new sister, yet. Keeping our fingers crossed & saying our prayers! Our standard Aussiedoodle Savi (short for Savannah) is getting along wonderfully, even with my other two dogs. Bailey, now renamed Abby, has made it to New Jersey this morning. She is absolutely loving, beautiful, soft and so amazing. Hope all is well! Our cavapoo Tucker has adjusted well to our family and is a joy! 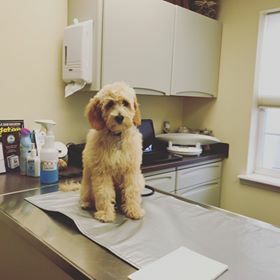 We took him to the vet last Thursday for his first puppy exam and orientation and he did great. . .
He’s done great with crate training . . . and with potty training. Wonderful little puppy. We just want to say how much we love and adore our mini Goldendoodle Sophie (was Greta), from Crockett Doodles. Sophie is so spoiled; she loves her sister the Rottweiler, Bella. Sophie jumps and plays like she is grown—already potty trained with the bell—super, super smart. We will purchase another pup from you one day down the road. Just wanted to say thank you for Tolstoy (formerly Rudy), our red mini Goldendoodle from Crockett Doodles. We are so blessed to have this little guy be part of the family. So sweet, so good. Had a great check-up at the vet, and he is adapting well. Sharing a photo of him watching puppies on Animal Planet for a few minutes. Adorable. Oh, Jack got to pick from the litter and Katie got to name him. War and Peace is her favorite book. Big name for a little guy, but he wears it well. 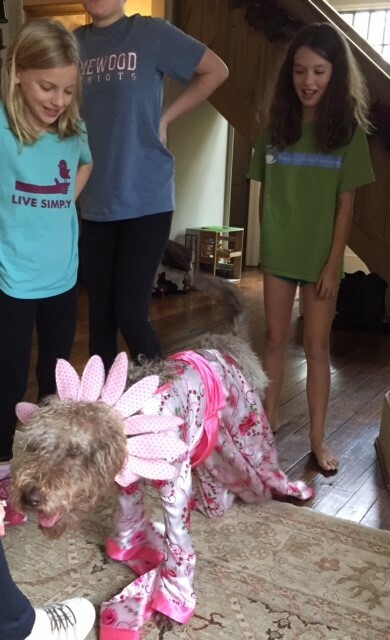 Life with Paisley Grace, our petite Goldendoodle! Formally Molly. We love her so much!!! Thank you SO much for our wonderful dog! 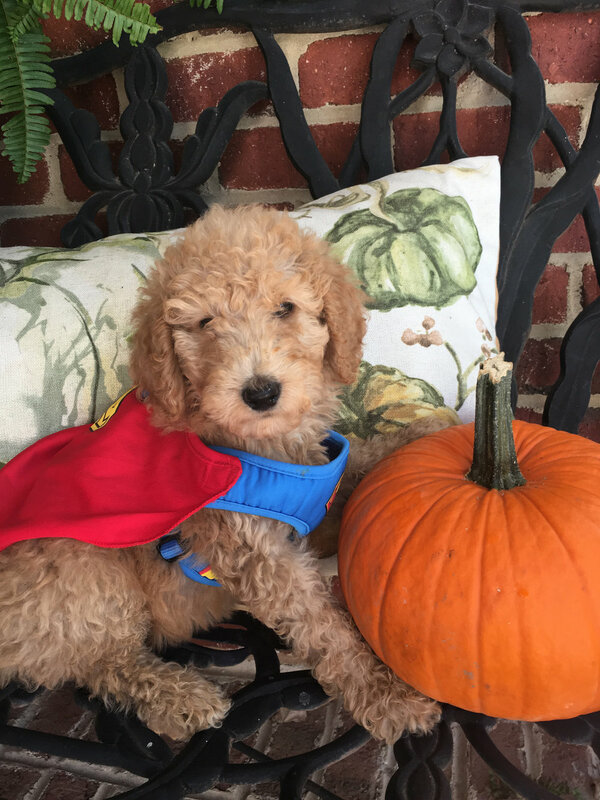 Had Mango our mini Goldendoodle two weeks today and what a joy she is; I am blessed…She did very well on our trip back to BHM and then to Ft. Worth. She never did whimper for the litter mates, seems very happy with her new home and can go in and out the doggie door by herself. . . . loves her backyard and romping in the bushes. She is much loved and I think she feels the same way about me!! May you and your family have a wonderful fall and holiday season. I wanted to let you know everything is going wonderful with mini Goldendoodle Paxton! He has been so easy to crate and potty train. Our cockapoo Reggie from bestCockapoos.com is doing great at his forever home!!! We are having a blast with him! He is truly the perfect puppy for our family! We love him!! Thanks Nathan Crockett! This is Linda. Ed and I absolutely adore Stella (formerly Bristol). We could not be happier. She is just Perfect in every way! Adjusting very nicely. She is so fun, funny, cuddly and smart. Thank You for your time with us and all you did to make the smooth transition. Words cannot adequately describe our pleasant experiences with our little furry boy Oliver. Nathan, we are just in love with Alice, our mini Goldendoodle. She is the sweetest and smartest little puppy!!!!! She is completely potty trained if we are on time .She has had only one accident in front of the door and she goes the second her feet touch the ground. We’ve never had one that young to get the idea so fast. She loves Mulligan and the children. Mulligan thinks his job is herding her and he even tolerates her sleeping with him for a short nap . I could go on about puppy tales but you get the picture. She is perfectly at home now as she doesn’t cry at all at night anymore. Attached, please find the receipt from Neutering Enzo, birth name was “Charleston”, along with a current photo, and rabies vaccination certificate. We picked him up from you on 12/30/2016. He is such a good boy! We are so grateful to be able to share our lives with him. He is super intelligent and a great companion. I thank god for leading us to you for Enzo, we love him so much! I hope you are still doing this when the time comes for another puppy. It was well worth the drive from South Florida! If you have any questions, or need anything else from us, do not hesitate to reach out. I just wanted to give you an update on our dog that we got from you after Christmas. He is such a complete blessing to our family. He is extremely smart, sailing through all of the tricks and commands he was taught and level one training. He struggles a little bit with submission in heeling and sitting on command when he is not feeling like it. We have a great coach helping us and our goal is still to have him be a service dog. He already has a different demeanor with Abbie than everyone else. He seems to know and is very gentle with her. He is truly such a blessing to us and we are so grateful you allowed us to adopt him. He is happy and playful and runs circles around the other goldendoodles at training. We truly got the best of both temperaments – the poodle and a golden. Paws is still doing well. I am taking him this weekend to be tested to become a service dog! He is an amazing part of our family and we love him so much! We are looking at adding a puppy to our family! We need a petite mini that wouldn’t exceed 30 lbs (but preferable smaller than that and under 20). Hope all is well. I wanted to share an update on Cooper. Our chocolate Labradoodle Cooper’s been with us a month now, and he is growing like a weed. He’s doubled his weight, from 7 pounds and his first vet check in to 15 pounds today. I can’t believe how much he’s grown in four weeks! He starts puppy classes this weekend, and he has all of his basic commands down. I also wanted to let you know we passed along your information to Elizabeth and Brian R. They are friends of ours from Charlotte and are considering adopting as well. I hope all is well. Thanks for giving me a call back earlier. In just the short 5 days that I’ve had Chaka, I’ve grown to love her already! She’s AMAZING!! And such a fast learner! She’s definitely the highlight to my day. We love her color and for me, the lighter the better but my girls didn’t really care about color either. Daisy is doing well and started puppy obedience school today! She and her hair are both growing and she continues to get cuter! Here is proof of Daisy’s spay! She’s doing great. Things have been pretty crazy here-we are expecting our 4th child in January, and we are moving to GA next week! She can sense change in the air but I think she will adjust well. I want to let you know that we are so in love with our puppy and we are spoiling her pretty good. We gave her dog ice cream after her first vet visit. 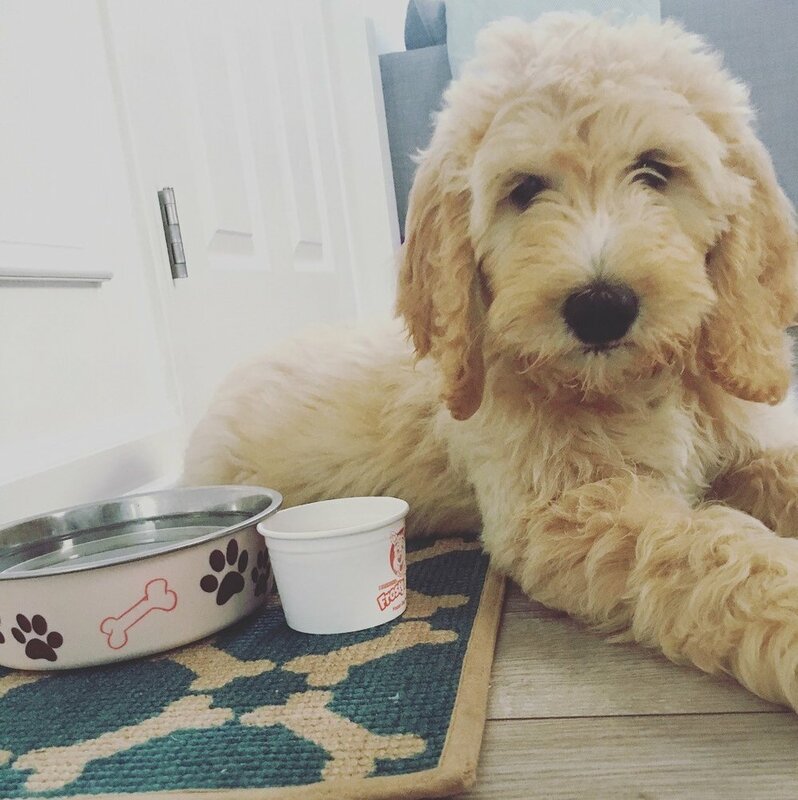 Just wanted to update you on our cream standard Labradoodle, Wallace. Just wanted to send you some updated pictures of George (since renamed Bear). He’s a great looking dog and has been exactly what we were looking for! He sheds very little yet looks mostly like a golden retriever. My wife and I are interested in getting a second puppy from you. Do you have any English Cream golden retrievers in your breeding program?